Join us on Tuesday, January 16th at 6PM PT/9PM ET for our #SamsBigGame Twitter party! We’ll be talking about how to throw a great party to watch the “Big Game,” as well as all the benefits of being a Sam’s Club member! There’ll be $500 in gift card prizes up for grabs, so be sure to RSVP to be eligible to win! Eligibility: RSVP by adding your Twitter account to the link above, and actively participate during the Twitter party with the hashtag #SamsBigGame on January 16th, 2018, from 6PM PT/9PM ET until 7PM PT/10PM ET. Winners will be chosen from the RSVP list using Random.org. Winners must be actively tweeting with the hashtag at the time they are randomly selected. Winners will be notified with an @ mention, and must respond via DM within 24 hours of being notified. 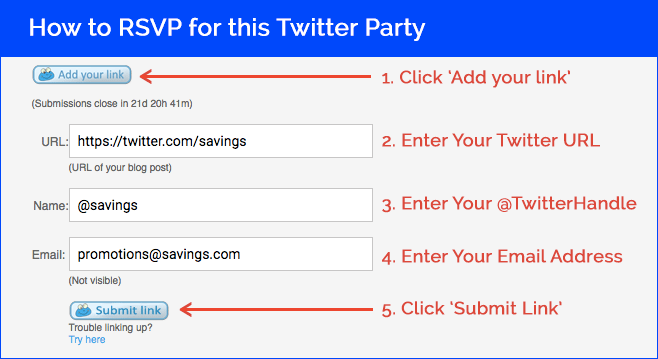 If another winner must be chosen after the party is over, winner will be randomly selected from active participants during the party. There is a limit of one prize per household during the party. Please allow 4-6 weeks for delivery of your prize. NO PURCHASE NECESSARY. VOID WHERE TAXED, PROHIBITED OR RESTRICTED BY LAW. Subject to official rules and open to residents of the United States and Canada. Let us know if you have any questions. See you at the party!